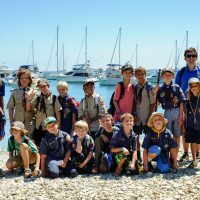 This Summer Pack 750’s Bears and Webelos got the opportunity to attend the Camp Cherry Valley Resident Camp! We had 15 boys attending for the Pack’s first time at resident camp. To say the trip was a success would be an understatement. The boys had a blast! Snorkeling, Kayaking, BB Guns, Archery, Hiking, Swimming, Star Gazing, Skits, Games are just some of the activities the boys got to participate in. They all returned home safely with a number of ranks and adventure requirements completed. Every boy asked if we can do this again next year. I think the answer is a resounding YES!